The Wedding Seating Plan...to help with the organisation. 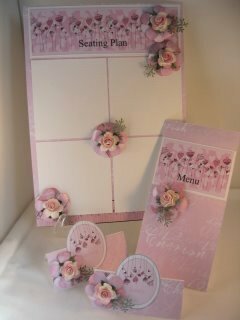 A seating plan is a useful addition to your wedding stationery and needs to be in keeping with the rest of the set. An A4 size card may be all that you need and it will be an indication of where your guests will be seated. You can of course make several of these, if you have a lot of tables, or make it on bigger card. The Top Table will seat the Bride and Groom, the Best Man, Chief Bridesmaid and each set of parents. The decoration for this table can be really eyecatching, and of course to suit your personal budget. For this particular wedding I added four equal sized panels to the A4 card so that for each of the tables a list of the guests names can be added. Each table will seat the number of guests that you designate. Label the table number and list the guests names for each table. Leave at the entrance to the dining room where your Wedding Breakfast is to be held, so that your guests can see where they are situated. If expense is an issue then adding place names, to each of the tables, can be sufficient to show your guests where they are to be seated and the need for a seating plan is gone. And if it is an informal seating group then the need for any of this is eliminated. Each of your guests can have an individual place name, and they are in keeping with the theme. Take an 8 x 7.5cms card and fold in half to create a tent fold. Computer generate the names in a text and colour to match the scheme of your wedding. Add to the base card and embellish as you wish. Adding gemstones, glitters, ribbons and flowers can personalise them to match the other elements in the set. These can be placed on each individual table to let your guests know what delicacies are in store for them. It is also something that can be sent out in advance especially if you are catering for any special dietary needs that your guests may have. Always give your self plenty of time to organise your wedding seating plan, and the rest of your stationery needs, as all this planning will take your energies and by the time you get to the day you will be too tired to enjoy it !! !